Diwali sweet recipes need to be listed now as then you can swap them with your friends and decide what to make finally! Diwali means sweet with the savoury and as we did start off giving you some savoury suggestions how about some lists of sweet things to serve. Use sugar or sugar substitute- mithai and desserts are the heart and soul of any Indian festival. Traditional sweets made with lots of fat and sugar are exciting to make at home especially if they are Diwali sweets. You could get hold of your mother’s diary or grandma’s diary and get going! When you cook at home, these Diwali sweets are not only of better quality than the commercial ones but are more hygienic and better accepted by your friends and dear ones as your personal touch is there in every gift. So what should you start zeroing on? Prepare attractive gift boxes and fill them up with a variety of laddoos placed in colourful paper cupcake holders. You could make Choco Coconut Laddoos, Dry Fruit and Khajur Laddoos, Rawa Laddoo, Badami Besan ke Laddoo, and the good old Boondi Laddoo! Something like boondi laddoo might be a laborious procedure but when the glistening little balls finally come up before you will feel immensely proud that you could do this at home. Another way to use up the sweet boondi is in this special Diwali sweet recipe of Boondi and Rabdi Stuffed Pancakes. Preheat oven to 180 ºC. Sift 1½ cups refined flour, 1 teaspoon baking powder and 1 teaspoon soda bicarbonate into a bowl. Add ¾ cup buttermilk and whisk to make a smooth batter. Add 2 tablespoons powdered sugar and mix. Heat a non-stick pan. Pour a ladleful of batter and spread it around. Cook till the underside is lightly browned. Flip and cook till the other side is cooked similarly. Transfer onto a plate and set aside. Cook other pancakes in the same way. Take boondi equivalent of 6 medium boondi laddoos ( or use up readymade laddoos!) in a bowl and add 1 tablespoon raisins and three to four tablespoons of rabdi and mix. Take a spring-form cake tin (loose-bottomed tin). Trim the pancakes to fit into the tin. Keep one pancake at the base of the tin. Spread some of the boondi stuffing over it. Cover with another pancake and spread some more of the stuffing. Keep another pancake and spread some more of the stuffing. Keep the tin in the preheated oven and bake for ten minutes. Remove from the oven and unmould. Cut into wedges and serve with rabdi. Some more suggestions for Diwali sweets coming up soon! 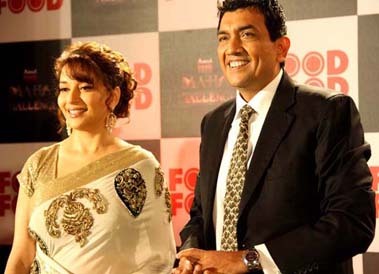 Yesterday addressed a press conference regarding the new show on FoodFood, Maha Challenge at Taj Land’s End in Bandra with Madhuri Dixit, where I presented the format of the show. More than hundred journalists from print, electronic and online media were there to cover it. It will have thirteen episodes, telecast beginning from September 1, 2011. Contestants from all over India have been chosen through auditions and roadshows held across many major cities in the country. I’m sure you all must’ve been following my past blogs where I’ve been writing a lot about this entire event. Coming back to the format of the show, two teams, each with eight individuals and their mentors will be competing every week. There will be a panel of judges as well as jury who’ll be deciding on the winners from the final competitions. The jury will consist of star chefs and celebrities from various fields. Apart from this, the Press Conference had a fun filled session where there was a roti rolling competition between Madhuri and me. This became a photo opportunity for most of the journalists. All this was followed by high-tea and the event successfully got over by the evening. By the time the event got over, I had to rush back to office to finish a portion of the shoot for Secret Recipes, and managed to catch a good night’s sleep just to return back to office today morning for a workshop on ‘Reputation Management and Branding through Social Media’ by social media expert Shashi Bellamkonda. Shashi, settled now in the US, is a very good friend and as he is holidaying in Mumbai just now he graciously accepted my invitation to address my team. The workshop was attended by all my staff alongwith Alyona and the representatives from the rest of our business partners like Popular Prakashan, Wonderchef, Indian Cookery Private Limited, indiancookery.com and FoodFood. Thanks Shashi for the information imparted, it will definitely help us as an organisation to reach out to wider audiences. We wound up with some snacks and coffee and that I will share here! Festival time begins with August just around the corner. As you browse the website for recipes for Rakshabandhan recipes or Ganesh Chaturthi recipes, there will be a desire to check out on Diwali recipes too. Well, we do not want to disappoint you so let us look at some snacks that will be perfect for Diwali snacking. Yes, of course, sweets and desserts are included too. To begin with a taste of the crunchy and crisp when you have a Diwali get together have some Mini Chinese Samosa or Crispy Spinach Parcels lined up. Something like Golden Bags and Mozzarella Pops will also satisfy those who love fried foods. If you like to put assembled dishes together, then Bhakarwadi Chaat or Chole Canapes are perfect party snacks. Why wait for Diwali, you could probably serve these at your next party! With so many savouries being discussed how about some unique desserts this Diwali? Rose Ice cream and creamy Rasgulla Phirni are perfect. Bring out your best china to serve these. For those who like traditional sweets Lavang Latika is ideal – resembles little firecrackers that are synonymous with the festival of lights. Watch out this space as we give you more and more ideas on how to list down your Diwali recipes. Counting days for Maha Challenge! Just wrapped up with the Teen Patti shoots yesterday. There are a lot of blueberry dishes alongwith simple chicken preparations and lots of warm desserts to look for in this schedule. And as I finished with this, it’s too much excitement for the upcoming and much awaited FoodFood’s Maha Challenge with Ms. Madhuri Dixit Nene. The shoots to begin from August 1, 2011 at a studio in Dahisar and will go on for almost twenty odd days. A little about the show – the show will consist of two teams with eight participants, mentored by Madhuri and me, which will be followed by normal elimination by the jury and the judges, who are yet to be finalized. Pretty hectic, I must say! But surely going to be fun with all the enthusiastic fans and a healthy competition between the teams. Eagerly looking forward to this event! Amongst all this shoot mayhem, it just completely slipped off from my mind…it’s been almost five years since the day Mumbai was trapped in heavy rains and floods. It still gives me goosebumps thinking about that chaotic and terrible day, which all the Mumbaikars experienced and can never forget! Somethings sometimes become just too real to be true! This popular Punjabi chicken dish has chicken cooked in a rich tomato and cream gravy. One would think that this is chicken cooked in butter but that’s far from the truth. Butter chicken is the most popular dish that characterizes the essence of Punjabi cooking. This recipe will make 4 portions. Prick 400 grams chicken pieces all over with a fork. Place them in a bowl, add 1 tsp red chilli powder, 1 tbsp lemon juice and ½ teaspoon salt. Mix well. Cover bowl with a cling film, set aside to marinate for 30 minutes in the fridge. To make the marinade, place ½ cup thick yogurt in a bowl. Add 2 tsps each ginger paste and garlic paste, ½ tsp red chilli powder, ½ tsp garam masala powder, 1 tsp salt and 2 tsps mustard oil. Mix well with a wooden spoon. Add chicken pieces to this mixture and mix well so that all the chicken pieces are well coated with marinade. Cover bowl with cling film and place in the fridge to marinate for 3-4 hours. Preheat the oven to 200°C / 400°F. String the chicken onto skewers and cook them in the preheated oven for 10-12 minutes. Baste chicken with 2 tbsps butter, cook for 2 minutes more.Take the skewers out of the oven and slide chicken pieces onto a plate and set aside. For the gravy, place heat a small non stick frying pan on medium heat. Add ¼ tsp kasoori methi and toss it for 2 minutes to make it crisp. Take the pan off the heat and remove the kasoori methi into a bowl and let it cool. Crush it with your hand to make powder. Set aside. Place a deep non stick pan on low heat and add 1 tablespoon butter. When it melts add 4 green cardamoms and 1 gram mace and cook till fragrant. Mix 1 tsp deghi red chilli powder in 1 tbsp water to make a paste. Add it to pan and stir. Add 5 cloves chopped garlic, ½ inch chopped ginger and 12 roughly chopped medium sized tomatoes. Mix well. Cook for 20 minutes or till tomatoes become pulpy. Strain the mixture into a bowl and transfer the residue into a blender jar and blend till smooth. Strain this too into the bowl. Place another deep non stick pan on low heat and add 1 tbsp butter. When it melts add the strained mixture and cook, stirring occasionally, for 15 minutes. Add kasoori methi, cook for 5 minutes more. Add 1 tsp salt, 1 tbsp honey and 3 tbsps cream and mix well. Cook for 2 minutes more. Add the chicken and cook for 3 minutes. Serve hot with naan. Finger licking good Butter Chicken is ready! What happens to that loaf of bread which is half used? It remains in the fridge till you think up of something. Well, bread is the base of many easy Indian snack recipes that are liked by young and old alike. In the north, the bread pakoda remains the all time favourite snack for children when they come back from school. We have this slightly enhanced version here for you. Call it Bread and Cheese Pakoda. Place 1 cup grated cheese in a bowl. Chop 2 spring onion greens and add. Chop the spring onion bulbs and add along with 2 chopped green chillies. Mix and set aside. Place 1 ½ cups gram flour in a bowl. Add ½ tsp carom seeds, salt to taste, ¼ tsp baking soda, ½ tsp red chilli powder, ¼ tsp turmeric powder and enough water. Whisk to make a smooth batter. Heat sufficient oil in a kadai. Also heat a non stick grill pan. Lightly toast 8 bread slices on the grill pan. Spread some date and tamarind chutney on 4 toasted slices and some mint and coriander chutney on the remaining 4. Spread the cheese mixture over the slices with date and tamarind chutney and cover with the slices with mint and coriander chutney and press gently. Cut each sandwich into 4 triangles. Dip the triangles in the gram flour batter and slide into the oil and deep fry till golden and crisp. Drain on absorbent paper and serve hot with any chutney. We can only rustle up other Indian snacks. Like Bread Upma, Bread Dosa and Bread Bhelpuri. The last will certainly dazzle your unexpected guests no end. And the Bread Dosa is ideal for school lunch boxes. If savouries are easy to do with bread so are some desserts. If you make something like Brown Bread Apple Cheese Toast you could be satisfied with it for it is ideal for breakfast and also as an early evening snack. It is also salty and sweet! But those who want sweet sweet endings, go for Double ka meetha and Brown Bread Pudding with great élan! 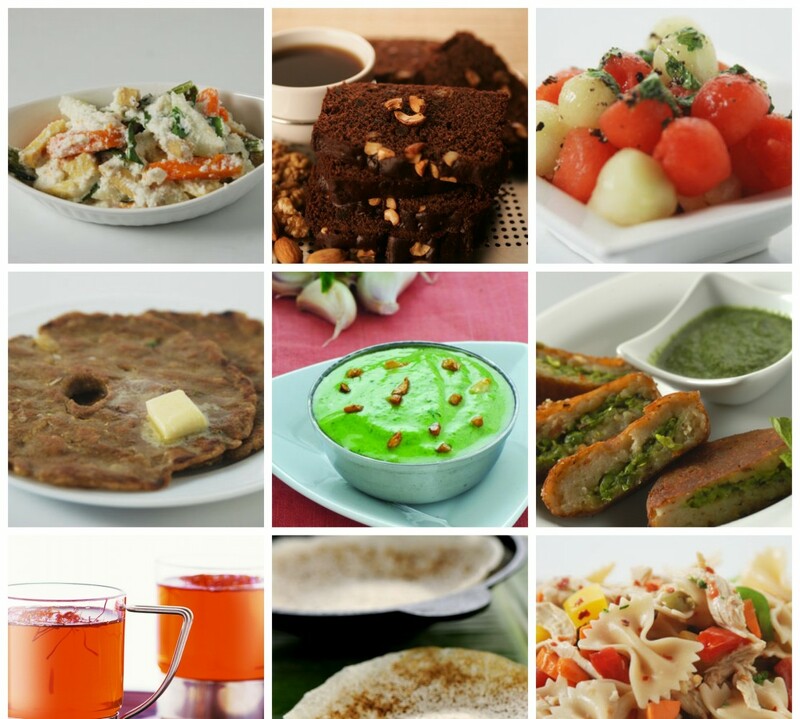 Indian snack recipes can be a carnival of delights during the festival season. Watch out this space! Back from Thailand and ready to take on the whirlwind of work! 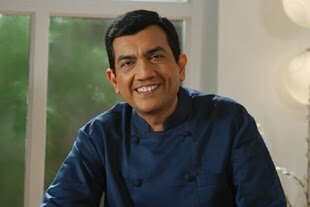 My latest focus is on redefining dining in India and to promote the Indian dining experience internationally. People often tell me, “We watch your show, but we really want to taste your food.” I believe this challenge of cooking for millions can be overcome by launching restaurants that will reach out to people. As food in India is synonymous with entertainment; people meet and bond over food. Keeping this in mind, we are creating a variety of experiences that range from the quality and ambience of a fine dining restaurant to experiential dining such as a new age Indian lounge. We are launching new restaurant brands like Signature, Sura Vie, Pin Yin Café and Khazana. At the Signature chain of restaurants, we aspire to position it as the last word on Indian cuisine by maintaining an air of elegance. Sura Vie Lounge is purveyor of a definitive eclectic experience with a focus on live contemporary Indian music. 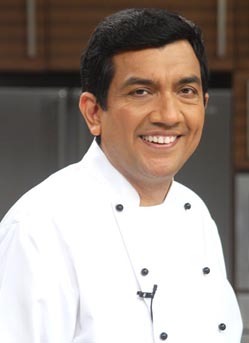 It will be launched in the key metros with international comfort food specially crafted from the chef’s table. Pin Yin Café is a casual oriental restaurant with an all day dining/ cafe format that serves popular oriental dishes. It will provide substantial, high quality, competitively priced, meals in the mid-casual dining segment. The cuisine will be popular Oriental, with menu options that include familiar Asian dishes such as Thai Green Curry etc. Khazana can be defined as an upscale restaurant that serves chef-inspired Indian dishes that are redefined. The goal is to make upscale Indian dining accessible and affordable to families and young professionals and showcase the Indian dining experience to tourists and expats in a luxurious ambience. We are also offering franchising opportunity for Khazana, The Yellow Chilli and Pin Yin Café. When I started my show on television it was the only one of its kind. Eighteen years on, Khana Khazana has become a household name in India and I have now launched my own TV channel. Managed to do so by packaging passion, dedication, energy and understanding of the consumer. Now my mission is to approach dining with the same passion and leverage our consumer insights to build world class restaurants globally. Let me wind up with some dishes that always please me when I come home after a long stint of travelling.